So said the late Louis Nucera – a famous French author and one of Nice’s most famous sons. The capital of the Cote d’Azur is a city of many qualities and the fact that its market is one of its principal attractions gives you some idea of how special it really is. The Marché Aux Fleurs conveniently tucked away just off the main seafront boulevard at the eastern extremity of the Promenade des Anglais/ Quai des Etats Unis. Underneath striped canopies of every colour, somewhere between 30 and 40 producers of flowers, fruit, vegetables and artisan foods from the Alpes Maritimes department (or “county”, as we might call it) ply their trade on a daily basis. This is the place to try such local delights as the unique Nice olives or the local wraps made in front of you. All the while, the entire lay-out is a feast for the eyes with its dazzling display of colour. This is a region where even in the middle of winter, you’ll have a huge representation of flowers. Spice merchants display their colourful produce in old-fashioned timber compartments. The scents are purely intoxicating. At the eastern end of the square is the house formerly occupied by the artist Henri Matisse, while at the other end, two places of note that are worth visiting are the magnificent Opera House and the irresistible Auer chocolaterie just opposite. The latter has remained unchanged since it opened its doors almost 200 years ago. 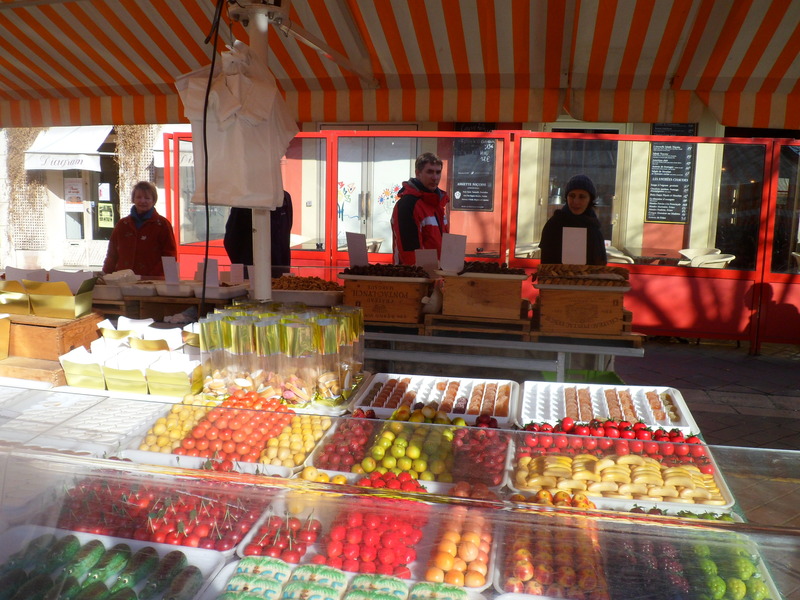 The Nice Marché Aux Fleurs is open throughout the year on all days except Mondays. Opening hours are from 06:00 to 17:30, 06:00 to 18:00 on Saturdays and Wednesdays, 06:00 to 13:30 on Sundays and Bank Holidays.